While at the Lititz Historical Association, we had inquired about the General Sutter Inn to the tour guide we were chatting with. He said that along with the British pub connected to it are owned by the same person, a man who was from Liverpool, and that the food was authentic. This was good enough for us. The building dated back to 1754 and was beautiful inside. A small waiting room next to a fireplace opens up into a side dining room, and then another area which includes a bar. It contained fine dining decor, but the prices on the menu did not reflect this. 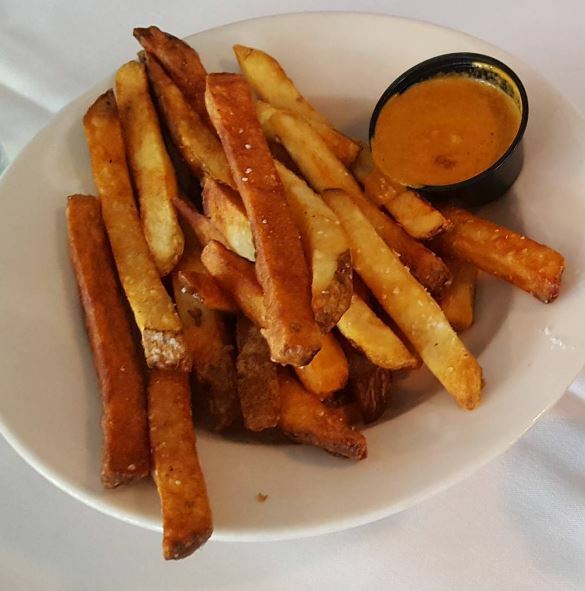 The pub also has the same menu if you are in the mood for a more casual experience. The first item that caught my eye was the chicken tikka masala. However, this was available only after 5 P.M. Many people do not realize just how integral Indian food is on the pub scene in England. Upon seeing that and a few other dishes, I realized that this was indeed the real deal. We started off with some curry fries in keeping with the Indian theme. They were fried to perfection, definitely homemade. The only downside was the curry sauce itself. It was very good–a blind tasting would have you think you were actually eating at an Indian restaurant. It was just so small. The fries by themselves were $3 while the addition of the sauce was another $3. This just does not make sense. They should definitely give a little more sauce with it, or just cover the fries themselves so you don’t see the amount. Also as an appetizer was a Scotch Egg. Both of us had never had one before. For $4, we figured we would order and split one just to get a taste. My friend did not like it. I thought it was okay. 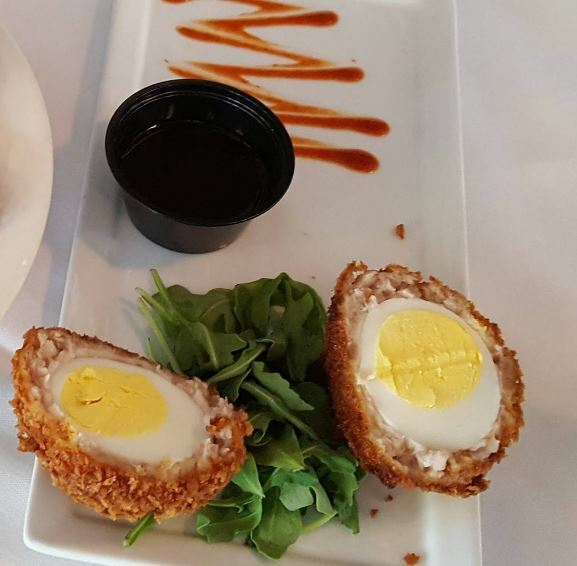 A normal Scotch Egg contains an uncooked egg wrapped in a nest of sausage, breaded, and then deep fried, which in turn cooks the egg. This was a hard-boiled egg (which the menu noted), but it just didn’t work. I can understand why they did this, but it was disappointing. Our meals would make up for the shortcomings of the appetizers. 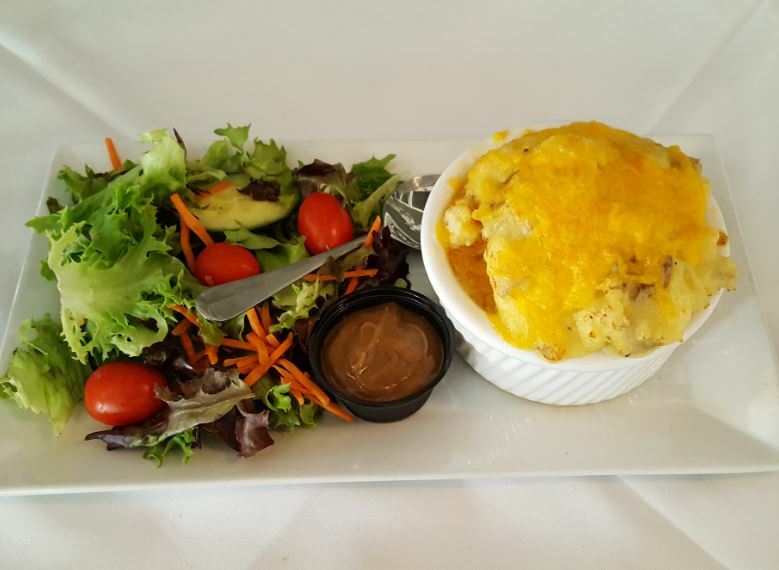 He had the Fisherman’s Pie, which was a casserole of salmon, shrimp, pollack, spinach, and tomatoes, covered with cheese and mashed potatoes. I tried a little bit and thought it was good. The stock was rich, the seafood tasted fresh, and those mashed potatoes just brought it all home. My meal was along the same lines; a Chicken and Leek Pie. This was covered in a pastry shell instead of mashed potatoes. 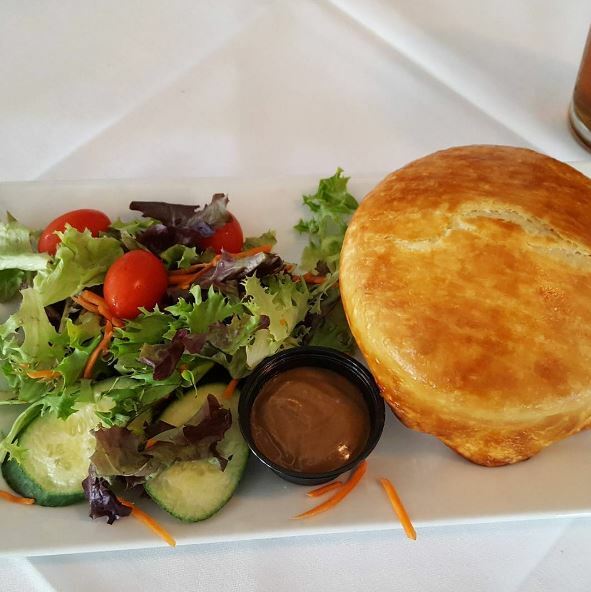 To describe this, just picture the best chicken pot pie you have ever had and put it on steroids. This thing was amazing. One of the best meals I have had out in this part of Pennsylvania, actually. Again, the stock was where the magic happened. A beautiful savory flavor, made even creamier by the leeks which were blended throughout. And that puff pastry was just to die for. Even more remarkable was the fact that it stayed burning hot the entire time I was eating it. Many restaurants fail in that department in trying to keep such a thick meal hot for an extended period of time. Both came with a small salad and balsamic vinaigrette, which was much needed to cut through the heaviness. Prices on everything were more than reasonable. Both pies were $13. Even the drink prices were right on the mark. An extended craft beer menu was so overwhelming that I just went with a Yuengling (one of the 30 or so beers they had on tap, in addition to bottles). A pint was $3.75. You won’t find that cheaper anywhere else, not out here or back in New Jersey. I debated long and hard about what score I wanted to give the General Sutter. I was inclined to go with a 4 because of the appetizers, but after further reflection I do not think they were poor enough to bring the score down. Food quality was excellent, service was friendly and attentive, and prices for a place like that were much lower than I expected. Let’s go with a 4.5 out of 5 stars. I will definitely be back. This review was originally posted here. The General Sutter Inn is located at 14 East Main Street in Lititz, Pennsylvania. Tomorrow, we will look at downtown Lititz as a whole. Such a wonderful small town.